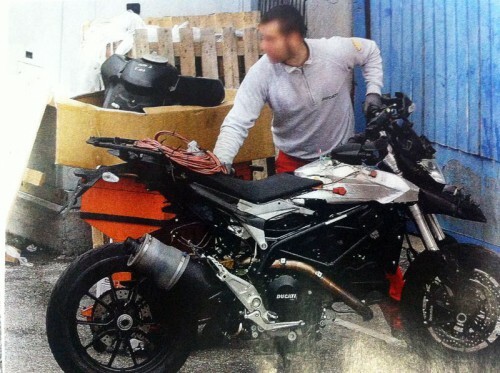 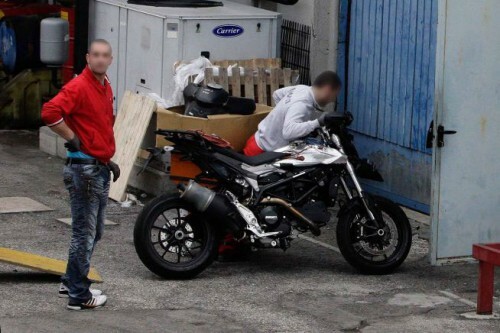 Spy photos have emerged of what appears to be a new liquid-cooled Ducati model As you can tell from the utilitarian-looking exhaust, it’s still a prototype, but the production version could be ready for this fall’s EICMA show. 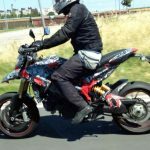 It’s not clear at this point whether this new model will be a new Hypermotard or possibly a new mid-sized Multistrada. 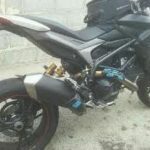 At first glance, the front “beak” fender and hand guards evokes the existing Ducati Hypermotards, but existing Hypermotard 796 and 1100EVO are both air-cooled and this model is liquid-cooled. 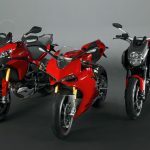 The Multistrada 1200 is liquid-cooled and also sports a side-mounted exhaust while the Hypermotards use twin underseat exhausts.The Multistrada has been far more successful than the Ducati’s Hypermotard line, and it seems odd to add a new liquid-cooled model to the air-cooled Hyper line. 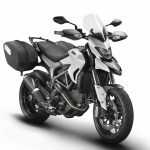 A new, smaller Multistrada slotted under the Ducati Multistrada 1200 makes more sense than another Hypermotard. 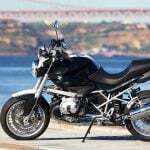 Based on Ducati’s usual pattern of repurposing engines from its sportbikes to its other product lines, along with the recent introduction of the 848 Streetfighter, the logical assumption would be this new model will use the same 849cc Testastretta V-Twin engine as the 848.